Aeration is critical to maintaining the health and quality of your grass. By properly aerating, the soil and grass will receive enough air and moisture to keep grass growing and reduce thatch. When you aerate the lawn, you make it easier for the roots to grow deep and strong, keeping your lawn looking hearty, fresh, and green throughout the spring and summer. If your lawn is made up of cool season grass, then it is best to aerate in the fall and early spring. If you have warm season grass, late spring is the best time to do it. You can use a plug or spike aerator, which are tools that you can likely find in any hardware store or garden center. Irrigation is another key element to a well maintained lawn. Once you have it aerated, you then need to have a water source in place. You may want to consider having your existing irrigation system checked out by a professional lawn care service, just to ensure that it is in good shape and will work well. If you don’t have a system installed, it may be a good idea to do so in the spring. This will ensure that you have a well-watered lawn throughout the hottest months of the year. Maintaining your lawn year after year will help to keep it in good shape. Once the spring season starts, take some time to work outside, getting your property cleaned up and tended to. Make sure that you aerate your lawn so that your grass will grow in thick and beautiful. A quality irrigation system will help keep the grass healthy all summer long. Once you tackle these spring lawn care tasks, you won’t have to worry about it for the rest of the season. Since the ground is usually still soft and muddy in parts, you’ll want to do a quick and careful clean up. Gently rake up debris, such as leaves and branches, taking care to avoid soggy soil patches. It will take several warm and sunny days in a row to really start drying up the ground, so just focus on the areas that you can tend to in early spring. Prepping your lawn for better curb appeal will require removing those stubborn weeds. Pull out what you can by hand on the lawn, along driveways and sidewalks, and in flower patches. You can treat your lawn with a weed control product, and it is best to do this before putting grass seed down on bare patches. Using a weed control chemical can help prevent the growth of crabgrass. Spring is the ideal time to start growing grass. Make sure that your lawn is level by fixing trouble spots. You can fill them in with a nutritive soil to level it out. This will ensure that the grass seed has enough nutrients to help the growing process along. Once you have the lawn prepped, you can then put down grass seed and tend to it daily. Make sure that you keep it watered accordingly. It’s very common to have bare patches on your lawn after a cold and snowy winter. You will want to make sure that your lawn mower is in good working condition so that once you’re grass is ready to be mowed, your equipment is up to the task. Don’t mow too soon over new grass growth. Have your lawn care clippers sharpened to keep things trimmed up, purchase a new pair of gardening gloves, and get ready to enjoy a beautiful lawn all spring and summer long. A pergola is a beautiful visual feature that can also serve a purpose. You can plant climbing vines and flowering vines along the sides, which will create natural shade for the area below. This is ideal for a patio or deck that gets a lot of sun during the day. No matter how large or small of an area you are working with, you can build a pergola to suit the space. It adds a level of elegance to an otherwise simple landscaping design. If you would like a little extra privacy around your patio or seating area, consider planting shrubs or bushes around the perimeter. It’s much more affordable than fencing, and it’s an easy way to incorporate plant life around a concrete or brick surface. You can really define and section off a seating area this way. For outdoor areas that don’t have a patio or deck in place, consider it a blank canvas to work with. If you have a space where you would like to create a comfortable seating and entertaining area, you can put down pavers to make a patio. This will create a nice level surface where you can add outdoor furniture, a grill, and even a fire pit. Make space for a table and chairs where you can relax and dine. You can also use pavers to create a walkway that extends out into a garden in the yard, or along the side of the house. There are many ways to transform your current outdoor living space into something that is both beautiful and functional. Simple improvements here and there to the existing landscape design will instantly add value and visual interest without breaking the bank. Enjoy your outdoor living area throughout the spring, summer, and fall by making easy upgrades. 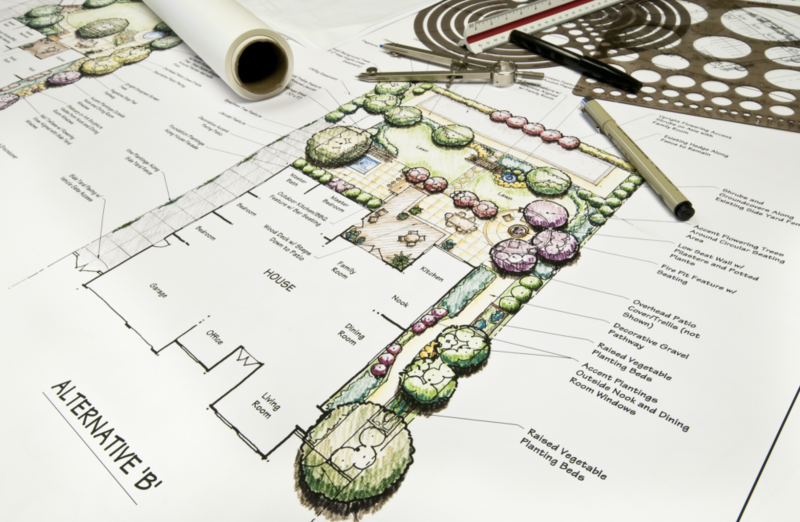 When creating a landscape design for your outdoor area, it is important to consider your pet. There are a few things that you need to keep in mind, in order to create a space that works for both you and your animal. With the right plan in place, pets and outdoor living spaces can go well together. 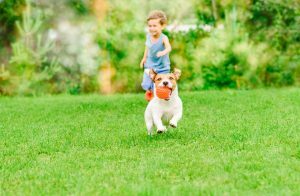 It’s no secret that dogs love spending time outside, so you want to have room for them to run and roam freely, whenever possible. In order to do so safely, add a fence around the perimeter of the backyard. This will keep your pet protected while giving them the ability to run and play. A fence will also give you privacy, allowing you to create a retreat where you can enjoy spending time. Add a water feature, like a fountain or a small pond, into your landscaping design. Your pet will love taking a sip of fresh water, or even splashing around in it. It adds both visual appeal and gives your pooch a place to play on warm days. Use trees or tall bushes and shrubs to create shady areas in the yard. If you have a patio, be sure to put up an umbrella or install a retractable awning. 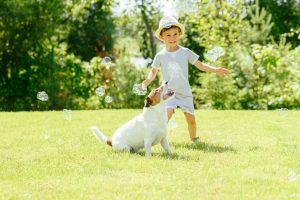 Your pets can get uncomfortable and overheated on hot days, too, so be sure to give them shady areas where they can cool off and get out of the sun. Another option is to add a doghouse where your pet can relax while outside. Make sure that you check any and all plant life before getting them into the ground to ensure that they are not harmful or toxic to pets. There are some plants that can be deadly if your animal ingests them, so take time to do a little research and double checking before settling on your landscape design elements. Another thing to look out for is the chemicals used in lawn treatment products. Many pesticides used in weed killers could pose a threat, so be sure to read all labels. By taking time to consider the needs of your animal, you can create a great outdoor living space that you will both enjoy. ‘Tis the Season’ often brings on thoughts of sitting around an indoor fireplace leaving winter outside where it belongs. While this is understandable when the ‘weather outside if frightful’ what about those times when being outdoors is more than desirable? Giving unique holiday/Christmas gifts to those who enjoy spending time in living areas beyond the walls of their homes may require something just a bit different. Outdoor gifts are the perfect answer when the recipient already has everything needed to enjoy indoor living. No one should be surprised to learn that there is more to a home than what can be found only after entering through a doorway. A home’s exterior generally includes lawn, garden and patio and these offer numerous opportunities for spending leisure time and quiet evenings soaking up as much natural light and fresh air as possible. The only thing is that sometimes that area is left unattended to and becomes less than attractive with little if any appeal. Generous individuals who would like to give unique holiday/Christmas gifts to someone special should seriously consider outdoor gifts. Gifting someone or a family with a custom designed covered patio, complete with a hot tub and fireplace, could make the recipient’s dreams come true. Anyone who enjoys entertaining could spend many hours delighting in this kind of amazing gift. An outdoor kitchen is the epitome of outdoor gifts because it provides even more opportunity for nature lovers to bask in their surroundings and becomes the gift that keeps on giving. Such unique holiday/Christmas gifts may be intended for a single person or family, but it is unusual when they are not shared with others. Done right they can even become the envy of neighbors, friends and acquaintances. Something as simple as a small pond with rocks and foliage tucked into an intimate corner of the yard can provide inspiration for other outdoor gifts. The only limit to what can be done with unique holiday/Christmas gifts is the imagination. Bringing creativity to life can warm up anyone’s holiday season. To explore the possibilities available for your outdoor space, contact Hidden Creek Landscaping today. As families prepare the home for holiday gatherings, it is important to take advantage of every inch of space. The patio is often an afterthought when it comes to holiday entertaining, but a beautiful space should not be wasted. Even though it may be a bit chilly outdoors, this area is a great location for holiday parties. Learning a few tips to prepare the area will make it a welcoming spot in all weather conditions. The most important thing that gives an outdoor space the ability to host guests for a holiday event is heat. A homeowner may consider small portable heaters or larger and more permanent fireplaces. Fire pits are affordable options for patio heating and provide focal points for friends to gather around and make holiday memories. The winter holidays are meant to exude cheer and comfort. If a gathering will be held in a covered patio, adding cozy curtains provides an inviting appearance. The furniture should be covered in bright pillows and warm blankets as well. Although many parts of the country experience cool holiday weather, it is possible to create a welcoming outdoor space. An open patio can be lined with decorative screens or a retractable roof to keep the elements from becoming bothersome. If the budget allows, it may be wise to enclose the space with glass. This allows the beauty of winter to be viewed without the harsh and cold temperatures. Holiday decorating means more than hanging ornaments from a tree or placing lights in the windows. It includes preparing both outside and inside space where family and friends can gather for special celebrations. Despite the cool weather, a bright and comfortable patio makes an excellent place to entertain guests and ring in holiday cheer. Hidden Creek Landscaping is happy to work with you to plan your new patio design, and help you make use of it all year round. Contact us today to schedule a meeting. With shorter, and colder, days in the fall and winter there are two major things to consider in your patio design if you wish to extend its use through the colder months. Those things are warmth and lighting. If your patio design does not take warmth and lighting into account, your patio will be enjoyable for a much smaller portion of the year; not the best thing considering your investment in upgrading your outdoor space. With a few additions to your patio design, you can truly make the most of your new outdoor space. Simply putting in a fire pit or installing a stone fireplace is a great way to transition a seating area from the spring and summer into the fall and winter. It adds warmth, charm, and functionality to the space. Not only will a fire pit provide a great source of warmth, it also will serve as a fantastic lighting source as well. Fire pits differ from artificial lights in that they appear more alive and natural, providing a greater ambiance to your patio space. Keeping your outdoor space well lit is even more important during fall and winter as the days are much shorter, leaving you with less time to enjoy natural light. Trends for landscape lighting include the use of LEDs, as they are great for highlighting certain features, such as sculptures and fountains. The right lighting will add ambiance to any outdoor living area. The key lies in identifying the highlights of your patio space, and using the proper lighting to accentuate them further in the evening hours. Hidden Creek Landscaping works with you to determine a patio design that will best fit your style, budget, and lifestyle. If you are concerned about keeping your patio space functional for the majority of the year, even during colder months, please contact us today to discuss the options that are available to you. 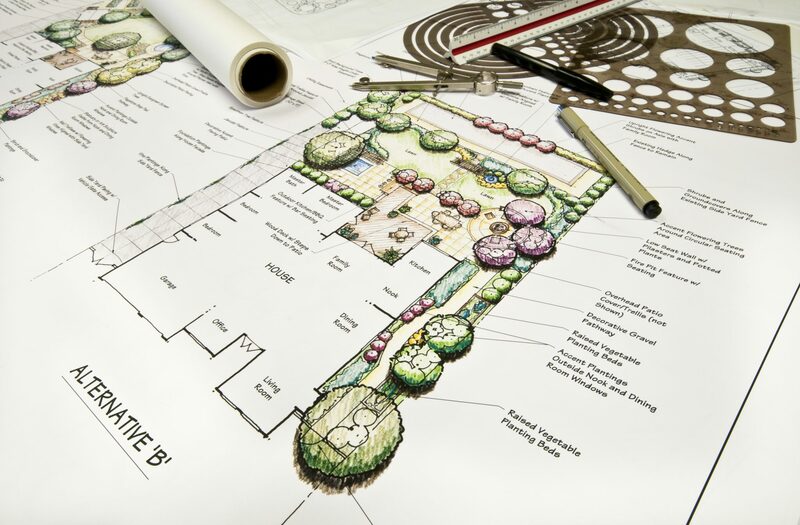 Whether you are designing a completely new space, or updating an older space, Hidden Creek Landscaping can help you make the most of your outdoor investment. Contact us today to request a quote.